Help! I broke my wrist! A broken wrist is one of the most common orthopedic injuries requiring treatment – so if you think you’ve broken your wrist, don’t worry, you’re not alone. This post will specifically address what is called a distal radius fracture, which is an injury to the very end of the forearm bone. There are other bones in the wrist that you can break, the most common being the scaphoid, but this article will address the more common type of wrist fracture (the distal radius fracture). While distal radius fractures are found in all age groups, they tend to cluster in younger patients from higher energy mechanisms (falling from a height, motor vehicle accidents, etc. ), and middle aged or older patients, usually from a simple fall onto an outstretched wrist (FOOSH! for short). What do I do after I’ve broken my wrist? First, you will need an accurate diagnosis. Anytime you think you may have broken a bone, it is wise to seek prompt medical attention at an ER, urgent, care, or doctor’s office. X-rays will be needed to confirm the diagnosis and begin to answer a few questions that will help to determine what type of treatment you will need. If you have a broken wrist, the first question to answer is how far has the bone moved from it’s original location (this is called displacement). Most fractures are not displaced or minimally displaced and may be appropriately treated with a simple splint followed by a cast for approximately 6 weeks total. However, if the bone has moved significantly from it’s original location, an attempt should be made to move the bone back to its original home. This requires adequate sedation as it would be quite uncomfortable otherwise, a skilled emergency room doctor (or on call orthopedic physician), and will generally need to be performed in an emergency room. Most broken wrists don’t need surgery. However, the ultimate answer for whether you will need surgery must take numerous factors into account including how far the bone is moved, if the break extends directly into the wrist joint, your age, your functional status, if it is your dominant hand, and any other medical problems you might have. If your broken wrist does require surgery, the treatment of choice is to use a plate a screws applied to the bone after it has been placed back in the correct position. (The image that accompanies this post shows a standard plate and screw option to hold the bone in place while it heals.) The plate is quite small and contoured to sit in a low profile fashion directly on the bone. The surgery is an outpatient surgery (meaning you don’t have to spend the night in the hospital) and is performed under a general anesthesia (meaning you will be asleep for the surgery). For pain control, most patients opt for a nerve block which keeps the arm completely numb for a period of time after surgery, effectively limiting post-operative pain. There are several other surgical options (pin, external fixatiors, spanning plates, etc.) 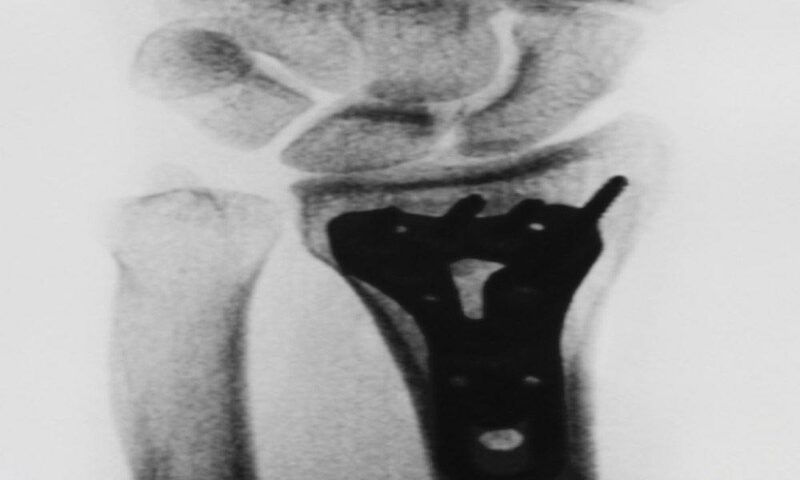 to treat distal radius fractures, but the plate and screws option is the most appropriate for most patients. The primary goal of the immediate post-operative period is pain control. The nerve block will generally take care of the pain from surgery for 8-12 hours and pain medication is required for a varying period of time after surgery. Rest and elevation are necessary for several days as well. At the two week mark, the splint which was placed at the time of surgery is remove and a custom removable brace is applied. Physical therapy for range of motion is usually started at this time as well. After about six weeks the patient will wean from use of the brace and but asked to continue to limit the use of the hand and wrist to light day to day activities for about a month after this. At this point, most patients are able to gradually return to full activities. Some wrist stiffness is the primary concern after any broken wrist (with or without surgery).